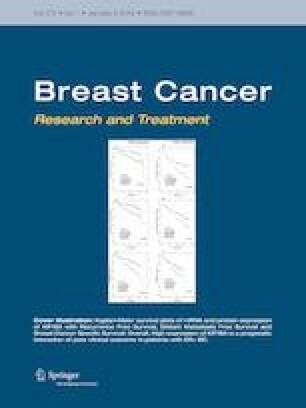 Tumour features associated with isolated invasive breast cancer (BC) ipsilateral local recurrence (ILR) after breast conservative treatment (BCT) and consequences on overall survival (OS) are still debated. Our objective was to investigate these points. Patients were retrospectively identified from a cohort of patients who underwent BCT for invasive BC in 16 cancer centres. End-points were ILR rate and OS. The impact of ILR on OS was assessed by multivariate analysis (MVA) for all patients and according to endocrine receptors (ERs) and grade or tumour subtypes. Of 15,570 patients, ILR rate was 3.1%. Cumulative ILR rates differed according to ERs/grade (ERs+/Grade2: HR 1.42, p = 0.010; ERs+/Grade3: HR 1.41, p = 0.067; ERs−: HR 2.14, p < 0.0001), endocrine therapy (HR 2.05, p < 0.0001) and age < 40-years old (HR 2.28, p = 0.005) in MVA. When MVA was adjusted on tumour subtype, the latter was the only independent factor. OS-after-ILR was significantly different according to ILR-free intervals (HR 4.96 for ILR-free interval between 2 and 5-years and HR 9.00 when < 2-years, in comparison with ≥ 5-years). ERs/Grade status, lack of endocrine therapy and tumour subtypes predict isolated ILR risk in patients treated with BCT. Short ILR-free-intervals represent a strong pejorative factor for OS. These results may help selecting initial treatment as well as tailoring ILR systemic chemotherapy. The online version of this article ( https://doi.org/10.1007/s10549-018-4944-2) contains supplementary material, which is available to authorized users. Study concepts: GH, AN, MC, AG and EL. Study design: GH, AN, MC, AG and EL. Data acquisition: GH, AN, MC, JMC, FR, CM, NC, AM, ED, CC, PEC, PG, MPC, PA, RR, CTL, XM, AA, AG and EL. Quality control of data and algorithms: GH, AN, MC, JMC, FR, CM, NC, AM, ED, CC, PEC, PG, MPC, PA, RR, CTL, XM, AA, AG and EL. Data analysis and interpretation: GH, AN, MC, JMC, FR, CM, NC, AM, ED, CC, PEC, PG, MPC, PA, RR, CTL, XM, AA, AG and EL. Statistical analysis: GH and EL. Manuscript preparation: GH, AN, MC, AG and EL. Manuscript editing: GH, AN, MC, AG and EL. Manuscript review: GH, AN, MC, JMC, FR, CM, NC, AM, ED, CC, PEC, PG, MPC, PA, RR, CTL, XM, AA, AG and EL. This research did not receive any specific grant from funding agencies in the public. commercial. or not-for-profit sectors. This work was approved by our institutional review board (IPC—Comité d’Orientation Stratégique). All procedures performed in this study involving human participants were done in accordance with the French ethical standards and with the 2008 Helsinki declaration. All included patients provided written informed consent before surgery.